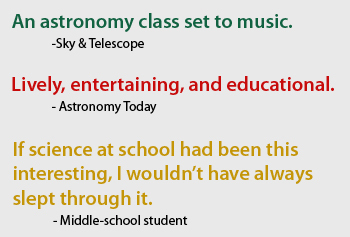 AstroCappella is a marriage of astronomy and music, developed by astronomers and educators and professionally recorded by the rocking a cappella group The Chromatics. The Chromatics' AstroCappella project can enhance your museum event, create a live multimedia planetarium show, do teacher workshops, or perform for kids. The Chromatics' mission is to spread science through a cappella and a cappella through science across a wide swath of the known Universe.